Step 1 Slice the baguette on the diagonal into half-inch slices, brush each slice with a little olive oil and grill the bread on a grill or in a pan. Reserve, keeping warm. Step 2 Rinse the mussels under cold water, scrub them if necessary and pull off and discard the beards. Discard any open or broken mussels. Reserve. Step 4In a large (6-quart) pot over medium heat, melt the butter. Add the leeks and saute until soft and translucent, turning the heat to low, about 5 to 7 minutes. Step 5Add the shallots, garlic, salt and pepper and cook for another 2 minutes. Step 6Increase the heat to high, then add the mussels and the white wine. Stir to combine, then cover and cook 5 to 7 minutes, until the mussels open up, shaking the pot so that the mussels cook evenly. When the mussels have opened, remove the pot from the heat and add the parsley. Serve immediately either in the pot or ladled into soup plates, with slices of grilled baguette for the leeks and sauce and a big bowl for the mussel shells. In Recipes-list.com we have selected the most viewed recipes from category - Appetizers Fish and shellfish Main courses . Enjoy the best recipes specially selected for you! 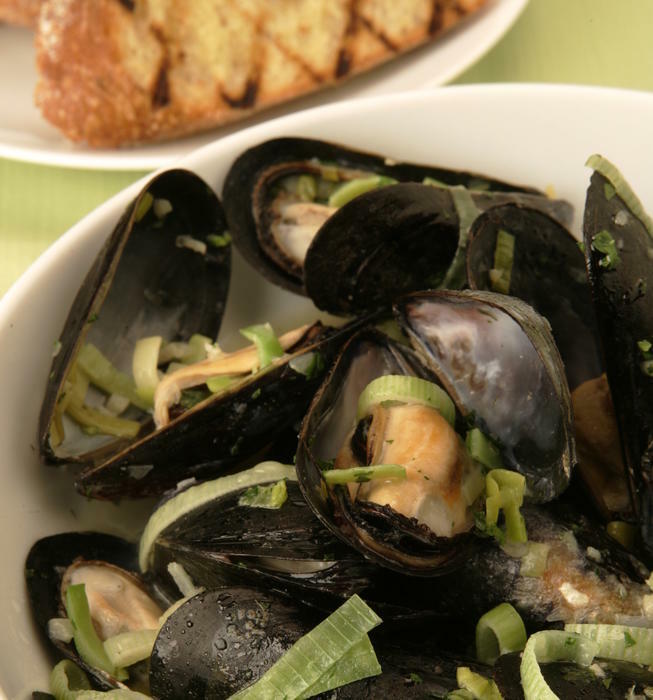 Mussels with leeks and white wine is the right choice that will satisfy all your claims.